We have made substantial investments in building technology-led solutions, with P2P platform-based services emerging as an essential component to market success. Of course, the biggest advantage goes to the customers who are the ones that truly benefit from our ongoing investments and upgrades. Here at getsix®, we are pleased to offer CAUSANDUM, our cloud-based BPaaS solution. This solution is unique in its value proposition of guaranteed savings, which is offered nowhere else in the industry. We guarantee that our expertise in business process transformation, combined with a state-of-the-art ERP system to will translate into savings for your organisation. If your company is considering professional outsourcing, supported by outstanding customer service, CAUSANDUM might be the solution you’re looking for. And, often the savings acquired mean you achieve accounting transformation for free – talk to us to learn more. Most organisations whether large or small, employ a variety of mechanisms for procuring and settling payment of goods and services. P2P is the process linking the purchase of goods to the final payment of those invoices. Traditionally there has been some separation between the procurement of the goods and the end accounts payable function. Procurement and expense management have become increasingly important measures of sustainable business success. For many organisations, the lack of a process automation strategy and visibility into the procure-to-pay cycle has a major impact on the bottom line. Each of these areas is labour-intensive and costly – involving the processing and distribution of large numbers of documents. Even the smallest errors can make the process inefficient, quickly draining available capital and resources. Automating Procure-to-Pay document processes delivers business advantages through increased efficiency and cost control. Focused and skilful management of the Procure-to-Pay cycle can improve relationships with vendors and free capital for core business-building activities. The deep embedding of technology in business in the late 20th century facilitated a rapid evolution in business practices of all kinds and supply chain was no exception. Historically, procurement and purchasing was seen as distinct from finance and accounting. Although the two functions may have shared a set of suppliers in common, the absence of joined up processes and detailed business intelligence and reporting meant that there was little opportunity to generate synergy. In the 21st century however, the synergy is compelling and significant process efficiencies can be gained through the implementation of Purchase-to-Pay. Providing continuously updated documentation to support compliance with Sarbanes-Oxley requirements and internal controls. 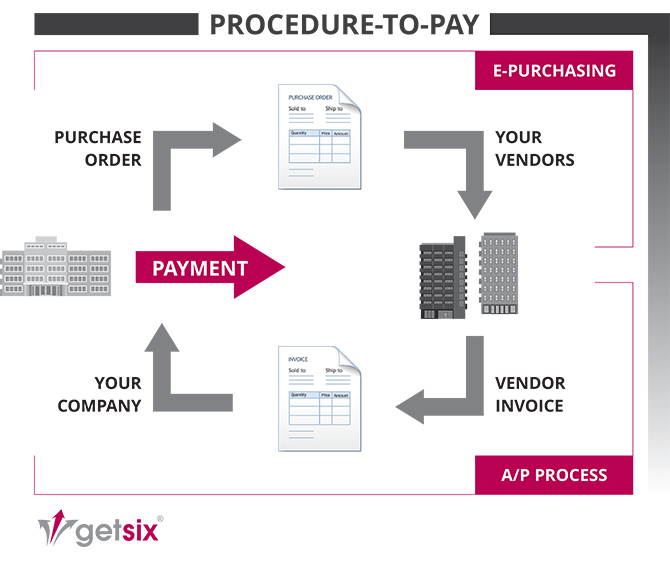 Why choose getsix® to manage your Procure-to-Pay processes? At the heart of our value proposition is the opportunity to change your operating model by tapping into skilled resources, while still working the way you work. In getsix®, you will find a partner who will consistently deliver quality, flexibility, innovation and value. Our approach is not only focused on the delivery of sustainable cost advantage and process transformation, but is totally aligned with your business goals. The accounts payable outsourcing solutions offered by getsix® streamline a variety of tasks such as payment run, month end accruals, taxation etc. to make the process smooth and orderly. Backed by our deep domain expertise in finance and accounting, ability to deliver sustainable cost savings, operational excellence, and performance transformation, getsix® partnership approach means we have the ability to be flexible in responding to your business needs. Increase flexibility to respond to dynamic market conditions. We have made significant investments in building technology-led solutions, with P2P platform-based services emerging as an essential component to market success. Of course, the biggest advantage goes to the customers who are the ones that truly benefit from the ongoing investments and upgrades. This solution is unique in its value proposition of guaranteed savings, which is offered nowhere else in the industry. We guarantee that our expertise in business process transformation combined with a state-of-the-art ERP system to will translate into savings for your organisation. If your company is considering professional outsourcing, supported by outstanding customer service, CAUSANDUM might be the solution you’re looking for. And, often the savings reaped mean you achieve accounting transformation for free – talk to us to learn more.